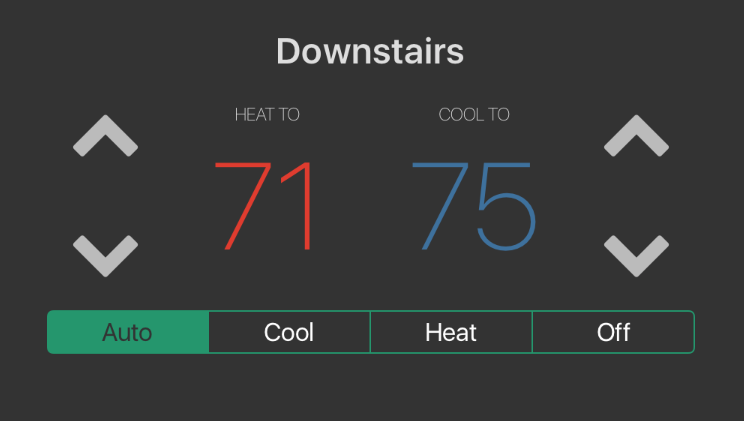 The Thermostats dashboard widget provides a quick and easy way to monitor and control connected thermostats integrated with your smart home hub. From the dashboard, it is easy to tell if a thermostat is idle, heating or cooling, and what the current temperature is at the thermostat. Tapping on a thermostat provides controls for changing thermostat modes and temperature set points. When the thermostat is in "Auto" mode and idle, a green leaf will be displayed, indicating that you are saving energy. When the HVAC begins to heat or cool, the leaf will change to a flame or snowflake to indicate the system is active. When the thermostat is in "Heating" or "Cooling" mode, a flame or snowflake will be displayed at all times. When the system is idle, the icon will be white. When the system is active, the icon will turn red (for heating) or blue (for cooling). Tapping on a thermostat in the dashboard widget will open the Thermostat Detail View. From here, the thermostat mode can be changed between Auto, Heating, Cooling and Off, and the thermostat set points can be changed, too. If the thermostat is in "Auto" mode, both the heating and cooling set points can be adjusted. If the thermostat is in Heating or Cooling modes, only the set point for the current mode can be adjusted. The thermostat widget currently assumes that all thermostats can toggle between Heating, Cooling and Auto modes. In a future update, the widget will attempt to only display modes actively supported by the connected HVAC system. 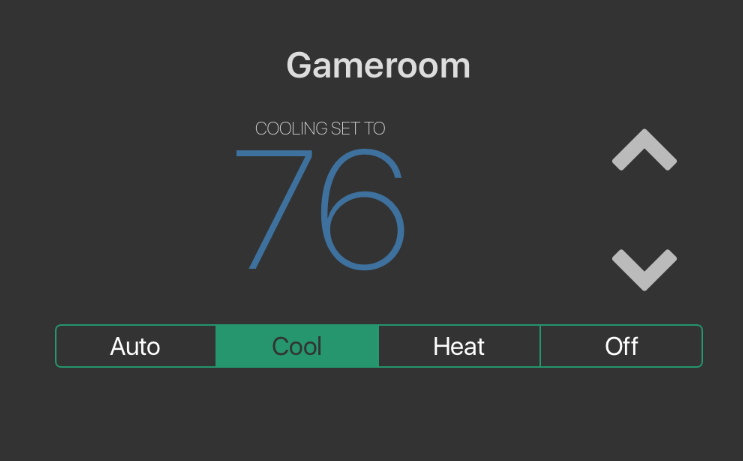 To use the Thermostat widget with Ecobee thermostats on Vera, the Ecobee Vera plugin must be installed on the Vera hub.